Agaricus blazei is a mushroom belonging to the genus Agaricus in the family Agaricaceae and is native to the Piedade area in Brazil. At Bizen we use techniques developed over many years to efficiently extract active macromolecular components from raw materials and create a standardized product containing a high molecular mass fraction with highly active anti-tumor properties. 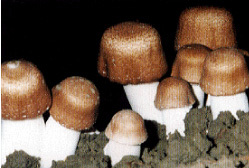 Agaricus blazei Extract Powder has been suggested to have anti-tumor properties. Agaricus extract powder was fractioned into high and low molecular weight fractions and we investigated the anti-tumor properties of these fractions in mice with transplanted cancer cells (Sarcom180). We found that the high molecular mass fraction had strong anti-tumor properties, and on further analysis we discovered that the active fraction was composed of poly-glycoprotein complexes.